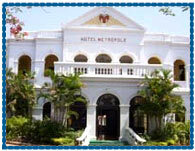 Hotel Metropole Mysore, Metropole Hotel Mysore, Reservation for Hotel Metropole, Mysore, India. 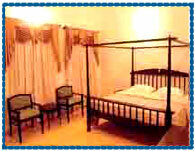 Address: Jhansi Lakshimibai Road, Mysore - 570 005, Karnataka, India. Hotel Metropole is situated at the heart of Mysore, in close proximity to the citys major tourist attraction- the Mysore Palace. Hotel is retaining the grandeur of the era gone, by decorating the mansion with period antiques, continues the buildings legacy of gracious hospitality combined with the ease of modern comforts. Hotel offers a total of 30 rooms and suits furnished with hand crafted antiques, complete with a range of modern amenities providing the epitome of elegance and seamless comfort. DVD Player on Demand, DVD Library, 59 Channel Cable/ Satellite TV, Hair Dryer, Electronic Safe, Lady Traveler Kit, Childrens Kit, Refrigerated Mini Bar, Mineral Water, Snack Basket, Fruit Basket, Tea/ Coffee Maker, Bathrobes, Cotton Slippers, Twice-daily Housekeeping Service, Butler Service, 24-Hour In-Room Dining , Laundry/ Dry Cleaning, Business Services, Wi-Fi High Speed E-mail and Internet Access, Multi-line Telephone , Speaker Phone, Transformers and Plug Adapters, Voice Mail, Secretarial Services, Shower, Channel Music, Smoke Alarms.